FNCE® provides an unmatched resource for gathering the latest information and innovations related to food, nutrition, and dietetics — an exclusive, once-a-year opportunity for dietitians and the food and nutrition industry to participate in live demonstrations, meet face-to-face and collaborate. The event continues to expand – attracting a wider audience of professionals, including dietitians, sports, health and nutrition professionals, chefs and students. Don’t miss out on your BEST opportunity to connect and network with the most influential decision makers in the food and nutrition industry! The FNCE® Expo is open to exhibitors whose products, programs and services relate specifically to food, nutrition and the profession of dietetics. Products, programs and services must be consistent with the Academy’s position on all current and published position papers; have a preponderance of current and scientifically valid information; comply with the U.S. Food and Drug Administration (FDA) rules, regulations and guidelines, if so regulated; are accredited through the National Commission for Certifying Agencies (NCCA), if required; and must supply a 510k for any medical devices. The Academy of Nutrition and Dietetics does not endorse any programs, products or services on the Expo floor. Attendees use their professional judgment to evaluate Exhibitor products, programs or services. The views expressed in Exhibitor materials do not necessarily reflect the official positions or policies of the Academy of Nutrition and Dietetics. No endorsement of Exhibitor’s programs, product or services should be inferred. Build business relationships, increase brand awareness and highlight innovative products and services at the Academy of Nutrition and Dietetics’ Food & Nutrition Conference & Expo™ (FNCE®). Interact and connect with this global network of dietitians and food and nutrition professionals, the purchasers and influencers in the nutrition and foodservice industries. Educational Sessions do not occur during these times. Booths are measured in 10′ x 10′ increments. Two or more inline booths can be combined to create a 10′ x 20′ configuration or larger. 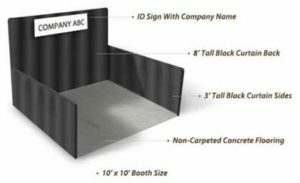 Pricing for these larger inline booths are based on the 10′ x 10′ base price. If you need pricing on a booth space not listed, please contact the FNCE® Exhibit Manager, doreen@corcexpo.com. Note: Carpeting is mandatory for all Exhibit booth spaces at FNCE® 2019 and must be ordered separately. Here you can find rules, regulations and guidelines surrounding your exhibit participation in the Food & Nutrition Conference & Expo™ (FNCE®). Exhibitors can learn more about the conference and expo by viewing these frequently asked questions.